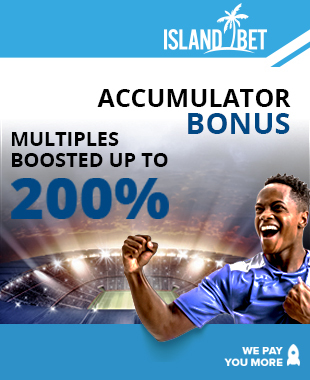 - Accumulator Bonus wants to enhance payout of your multiple bets. The more selections you pick in, the more Accumulator Bonus you achieve. - The Bonus percentages are applied to the potential winning of multiple bets (Net Winning = Payout - Stake). - The Bonus is awarded on multiples including 5-folds selections or more. Note that bets including 4-folds selections or less are eligible for the Bonus. - Odds lower than 1,20 make the related selections not able to be considered in the Accumulator Bonus calculation. Namely, a n-folds bet including one odd < 1,20 will be considered as n-1 folds bet in Accumulator Bonus calculation. - In addition, selections that are settled as VOID/CANCELLED will not be considered in the Accumulator Bonus calculation. Therefore, the actual Accumulator Bonus amount may change from the one reported first in the betslip. - Here follows the Accumulator Bonus ladder: next to each n-folds (events picked into the betslip) you find which percentage will be applied to the Net Winning.